The last four days have been a blur. If this is incoherent, I apologize. These two girls are just such a joy. We were out of straws for their "green smoothies", which led to these funny pictures. At the end of June, I resolved to not use two things in my kitchen during the month of July: sugar, and the microwave. While we try to eat as healthy as we can, these are two areas that had been hard for us/me to give up. I had predominantly been using "raw cane juice sugar" (basically, a less refined version of regular sugar) for baking. The only time I used the microwave was to reheat leftovers quickly, which was not every day, but it was almost daily. Why have all these children??!? Some people accuse "large" families of the stupidest reasons for having "so many" babies. I'm here to disprove them all. There is only one thing sweeter than a precious little baby. Wow, this has been some project! You may have heard about the unlawful acts of the police and councilmembers in a small town here in Arizona. A small town in Arizona is suddenly a YouTube sensation after a town-hall meeting devolved into a physical clash as a woman was forcibly removed from speaking during the public portion of the event. So not only is this one of those dorky posts typical of mommy blogs after a major holiday detailing all the things we did, but it is also one week late by now. It's been a busy week... I hope you'll still get a chuckle out of this. This is just so unbelievably disgusting. Please watch the entire clip. In all my wildest imaginations about how sick and evil the people and Planned Barrenhood are, I never could come up with this. Seriously? Can I no longer blog about ANYTHING without someone taking exception to what I am sharing on here? One of these days, I will have a blog post about nothing but wishing everyone a good day, just to see what will be deemed wrong with that. Yes, I talk to my babies in a happy, chirpy, high voice. Not that I even care what any expert thinks about this practice, but since it is so universal the world over, and has been for thousands of years, I'll take my chances and continue to make my babies grin from ear to ear as they understand that I am talking to THEM and THEM only. I will also continue to smile really big and coo at them every time I see them, since maybe that is why our babies are so exceptionally smiley. Since we are onto my baby-care shortfalls, did you know I also open my mouth when I spoon food into THEIR mouth? It's true. I also don't baby-proof the house, buckle them on the changing table (in fact, we don't even have one), take them for portraits at regular intervals, wash behind their ears, and sterilize any toy before giving it to them. And, let's not forget about the most reckless of my parenting choices, namely the fact that I don't use any birth control and actually think that children are a blessing! Basically, I am just one big Neanderthal of a mother, and it's a wonder five of the kids have made it through infancy in spite of me caring for them. 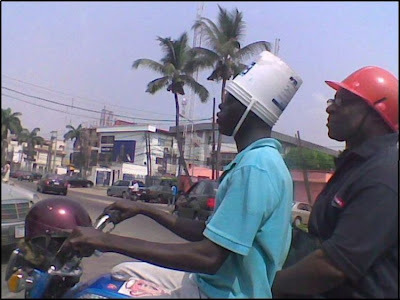 And bike helmets - seriously? What percentage of my adult readers wore a bike helmet as a child? Come on, anonymous know-it-alls, say it [cue whiny voice]: "Yeah, but back then, they also didn't use seatbelts in the back of cars, or car seats for kids, or airbags, or ..." Except that kids on bikes have only ever gone a certain speed, and it is just not all that dangerous. Sure, kids can get hurt if they fall off a bike. They can also get hurt if they roll out of the top bunk of their bed, decide to jump off a low roof or balcony, play chase outside, or do anything besides sitting on the sofa and watching TV. Boys especially seem to be wired for this kind of stuff. Still, just to ease your mind, yes, ALL of our kids ON BIKES wear their own helmets. Not because I think it will make them any safer, but because of obnoxious know-it-alls who like to stick their nose where it doesn't belong. But bike helmets on kids who are riding in the back of a bike trailer (which is also labeled as a stroller) - are you serious? Do you make your kids wear bike helmets in the car, or at the playground, or at home, or in the stroller? Because it would be comparable to that. In the extremely unlikely event that a car were to mow us over on a bike path that is only open to non-motorized users (bikes being the fastest of those), a helmet would do little good. There are no cars ANYWHERE, because the trail winds along golf courses and open fields, not roads. The chances of kids in the trailer overheating from wearing a helmet for no apparent reason seems a bit more real. And me? I refuse to wear a helmet. There. Can you believe it? It's not exactly like I am riding down the freeway on a motorcycle. Some people RUN faster than I can RIDE - should they put on protective body gear??!? In almost three decades of riding a bike, I have yet to encounter a situation where a helmet would have been of any benefit, including when I was broadsided by a car once when I was leaving school. Again, the path we use has ZERO cars on it, or even anywhere near it. And no, I am not just trying to save money and cut corners at the expense of anyone's health and well-being. Otherwise, I would hardly be spending three and four times as much as we "need" to on groceries to spare us all from the poison that conventional "food" is. The chances of getting cancer in America are 1 in 2 for men, and 1 in 3 for women. The chances of riding in a bike trailer and being involved in an accident that a bike helmet could have prevented: 1 in a million, at best. Can everyone with their underwear in a twist just find some other outlet for their grumpiness for a while?